The refractive index of optical microfiber (OM) changes with the temperature of OM caused by intensity modulated pump light. The phase of the probe light will be modulated while it passes through this fraction of OM because of thermo-optic effect. Optical phase modulator is an important component in optical systems. But at present most optical phase modulators based on electro-optic effect, thermo-optic effect or elastic-optic effect are driven by electrical signal and not suitable in compact optical system. 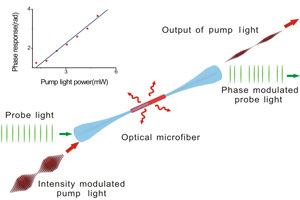 The researchers, led by associate professor Zhangqi Song, from National University of Defense Technology, presented an optical microfiber (OM) phase modulator directly driven by low-power light. It is reported in Chinese Optics Letters Volume 12, No.9, 2014 (http://www.osapublishing.org/col/abstract.cfm?uri=col-12-9-090606). OM is a kind of flexible optical waveguide between conventional optical fiber and integrated optical guide, and it is convenient to connect micro-components to optical fibers by OM. In the last decade, a variety of compact components and devices based on OMs have been reported, which makes it possible to construct tiny optical systems with OMs. In Zhangqi Song' research, the main part of the OM phase modulator is a fraction of OM taped from a section of normal communication optical fiber with much higher extrinsic absorption at 980 nm than intrinsic absorption because of hydroxyls, dopants, and impurities. When exposed to 980 nm light, the OM absorbs a small part of pump light and turns it into heat. Because of the tiny volume and a large ratio between surface and volume, the OM can be heated up and cooled down quickly with low-power pump light, which changes the refractive index. So the phase of probe light is modulated because of thermo-optic effect caused by pump light. Theoretical analysis shows that the bandwidth and phase response coefficient can be improved by reducing OM radius, increasing the length of OM and absorption coefficient of pump light. In this research, the OM phase modulator driven by low-power light has been experimentally demonstrated and preliminary theoretical analysis is given. Further works will be focused on increasing phase response and bandwidth of the OM phase modulator. "The OM phase modulator makes it possible to construct advanced compact all-optic system and optical fiber sensor based on OM," said Professor Zhou Meng from this group. The OM phase modulator features simple structure, large bandwidth, low driven power, and can be driven by dislocated pump light. It has promising application in all fiber-optics sensing system and integrated optics.